A couple of weeks ago I had the chance to visit The Facial Bar for the first time! 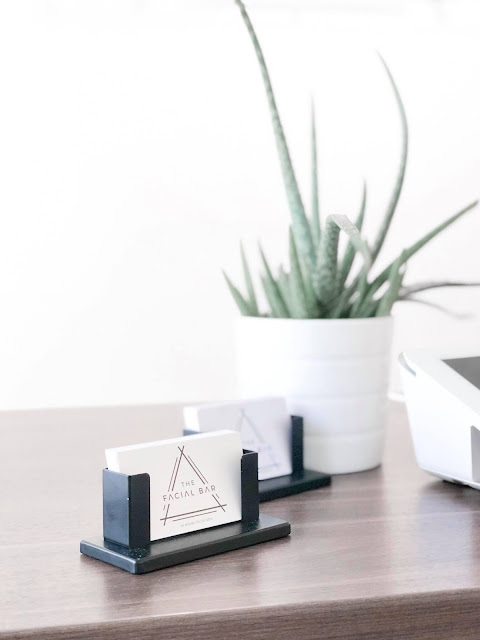 They were incredibly kind and invited me in to tour their space, learn more about their philosophy, and enjoy a complimentary lash lift + tint! Also, since visiting their Crossroads location The Facial Bar announced they'll be opening a second location in Olathe - huge congratulations to them! 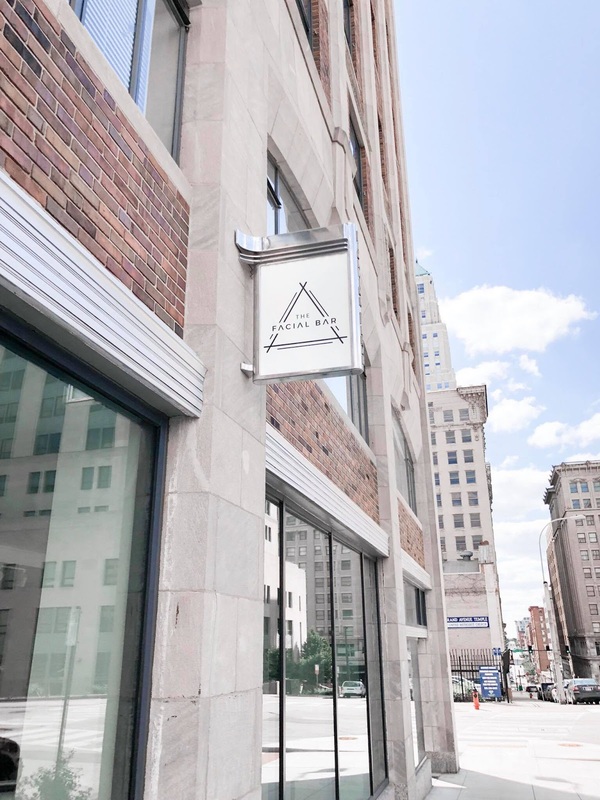 The Facial Bar was established in 2015 as the first and only facial salon in Kansas City. 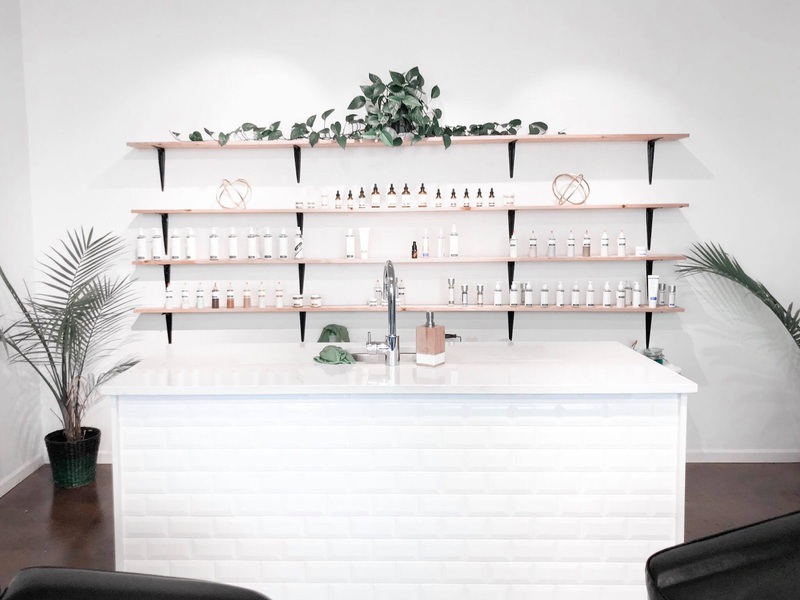 Priding themselves on providing a variety of skin care options suitable for any budget, The Facial Bar's goal is to make skin care accessible so that everyone can have healthy, glowing skin! Their services include facials, peels, waxing, and (most recently) lash lifts + tints. All of the skincare services offered are 30 minutes and include steam, neck & shoulder massage, extractions, and ice globes to end the service. 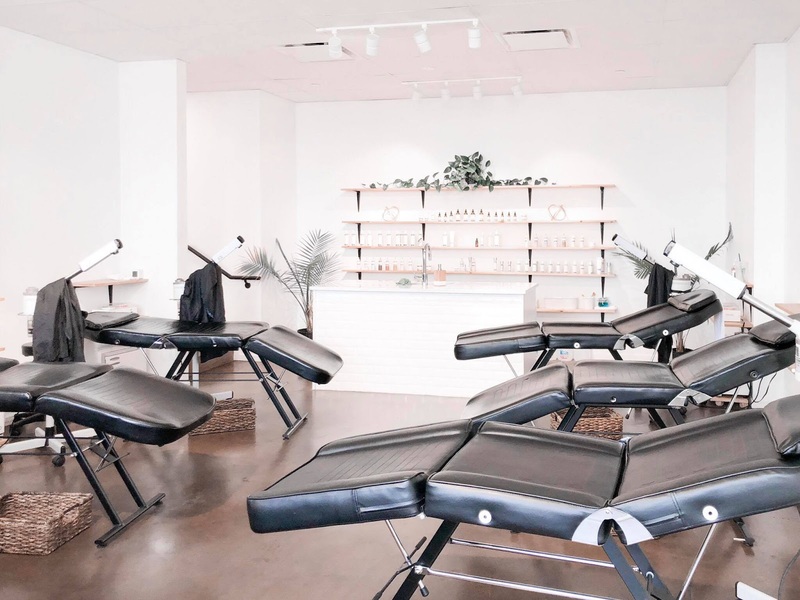 The aesthetic of the salon is light, airy, open, and clean. The chairs are arranged side-by-side in an open, casual environment to promote a laid-back, social feel. Now let's talk about my lashes. I have super straight, relatively light, and incredibly stubborn eyelashes. Lately they've been acting even crazier than normal going wonky directions (including into my eyeball) and laying flat across my lash line. In order to get them to cooperate I use an eyelash curler and waterproof mascara daily. To take my mascara off every night I just use Vaseline, my mom's preferred mascara removal product. I absolutely cannot use regular mascara (aka mascara that isn't waterproof) because it instantly makes my lashes flop down and go straight even after curling them. It's been a battle but I've finally gotten into a routine that I'm somewhat satisfied with. I curl my lashes with an eyelash curler similar to this, use CoverGirl So Lashy! blastPRO waterproof mascara for the first coat, and follow it up with a couple of very light coats of L'Oreal Voluminous Lash Paradise waterproof mascara. Now this is going to sound crazy but I find that drier mascaras tend to prevent lash-droopage more than wet ones. Recently I went back to one of my OG mascaras, L'Oreal Voluminous Original Mascara in Waterproof Carbon Black, and have really, really liked it. The formula is not nearly as wet as others I've tried making it great for layering. I've also heard L'Oreal Voluminous Original Mascara is a great dupe for Dior Diorshow Mascara (and much less expensive too at $5.79/tube vs. $29.50). I'm happier now with my lash routine than I ever have been but am always looking for opportunities for improvement. That's where the lash lift + tint at The Facial Bar comes into the picture! I went to my appointment at The Facial Bar with a clean face and no mascara or eye makeup on at all. The lash lift + tint appointment is about an hour and a half in length and I just took my makeup off right before I went - there's no specific length of time when your face + eyes need to be sans makeup prior to your appointment. Kristin, my lash guru, got me settled and gave me an overview of the lash lift + tint process. The first thing she did was put a couple of under-eye covers over my bottom lashes so that they wouldn't get intertwined with the top lashes. Then she combed my top lashes with a spoolie to get rid of any leftover makeup/debris. Next, Kristin placed a sticky tube type thing on my eyelid and along my lash line. This little tube was the "lift" mechanism of the lash lift + tint. Kristin then began to separate each of my lashes and adhere them to the tube making sure each lash was going the right direction and spaced evenly. After that the lifting cream was applied and allowed to sit for about 10 minutes. Once the lifting cream was done curling my lashes, setting cream was applied and then removed after an additional 10 minutes or so. Once the "lift" part was finished, the black tint was applied and given time to soak in. Kristin then used a solution to loosen the curling tube and remove leftover adhesive from my lashes. The process really was pretty quick and absolutely pain-free. If I hadn't been chatting the entire time I probably would have slept right through the whole process! When I got to see the finished product I did notice that my lashes were definitely darker and finally all going the same direction! Kristin did mention to me that typically one eye that will take the curl and tint a bit better than the other and, for me, that was my left eye. My lashes did curl but were still a bit stubborn in that department. Kristin did also mention that the more lash lifts + tints you get, the more you'll notice the effect. Basically you have to train your lashes to want to curl and accept the color and I'm sure I would see a more dramatic effect in future treatments! Before on the bottom, after on the top. The tint is definitely noticeable in this picture! In terms of aftercare, I had to be careful not to get my lashes wet for at least 24 hours and not sleep flat on my face that first night (which was more of a struggle for me than anything!). 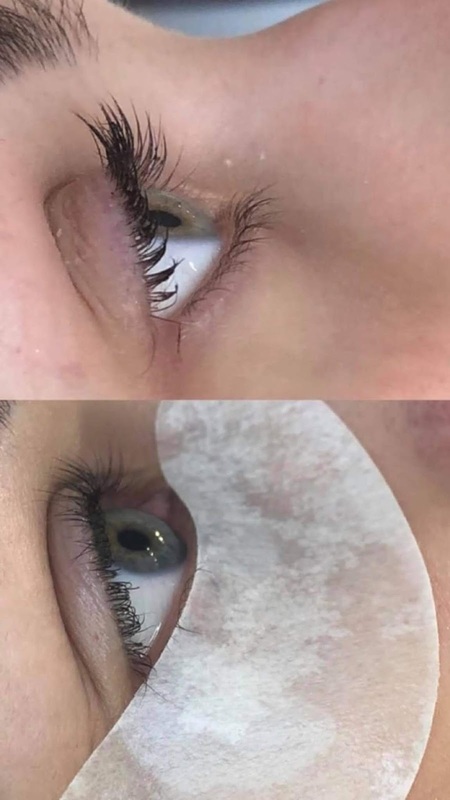 To make your lash lift + tint last longer, The Facial Bar recommends not using oil-based makeup removers or waterproof mascara. The longer you can go without applying mascara, the longer your lift + tint will last! 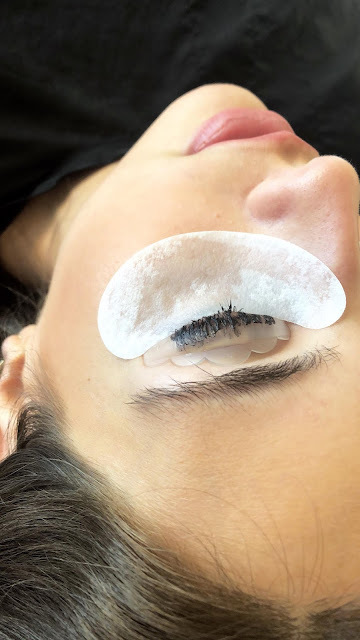 The results of the lash lift and tint became more pronounced over the next couple of days and I was truly so excited to not have my lashes flop right into my eyes! Overall my experience at The Facial Bar was a great one. The service was wonderful, the people were incredibly kind, and I'm excited to return and try other treatments!